ABB is a budgeting model used at UW in Seattle to govern the distribution of a portion of incremental operating revenues to units and is designed to provide greater transparency in the budget process. Revenues are distributed to schools and colleges using ABB principles. ABB does not distribute funds to the departmental level; each dean determines how to allocate these funds within their school or college. Under ABB, central resources, such as tuition revenue and indirect cost recovery (ICR) from research, are allocated directly to the unit responsible for the activity. First, however, a tax is taken to fund central operations and administration, strategic investments in student and faculty experience, and critical compliance efforts – shared expenses that would otherwise have no direct source of funds. What revenue is distributed by ABB? ABB includes distribution rules for three types of revenue: net tuition (operating fee) revenue, indirect cost recovery (ICR) from grants and contracts, and miscellaneous student fee revenue (e.g., revenue from application fees). The miscellaneous fee category represents only 1 percent of the sum of these three revenue sources, so we will focus here on net operating fee revenue and ICR. Under ABB, 70 percent of net tuition operating fee revenue is distributed to schools and colleges, and 30 percent is retained by the Provost for basic university functions and strategic investments. Indirect cost recovery (ICR) has been shared at the dean level for many years prior to ABB, (historically, this sharing was referenced as RSA and, later, RCR). Under ABB, 35 percent of ICR is returned to schools and colleges. Both tuition revenue and ICR are distributed to deans of schools and colleges rather than at the departmental level. What is the ABB tax and how is this funding used? The ABB tax is applied to both tuition and research activities (as well as to miscellaneous fees). These funds are kept centrally to help offset the many costs that are incurred centrally rather than locally. These costs include utilities, facilities and maintenance, grounds and landscaping, policing, human resources, central advising, and both research and academic administration. These funds are also used to provide support for academic units that cannot, on the basis of tuition alone, be self-supporting. Any increases in ABB revenue held centrally constitute Provost Reinvestment funds, which are used by the Provost to make strategic investments in both academic and central support units. I hear many of my colleagues blaming our difficult funding situation on ABB. Is that correct? No. ABB is not the reason why the University has limited funding. The recession required cutbacks in the face of increasing costs, and revenues since then have not increased sufficiently to overcome those previous cuts. It is likely that we will have limited funding for some time in the future, which makes the planning enabled by ABB even more important. Imbedded in ABB is the principle that in a modern research university, there will be cross-subsidies. It identifies the existence of subsidies, thereby providing an opportunity for them to be discussed. ABB fosters but does not demand self-reliance. In its most basic form, ABB is a method of budgeting in which revenues generated from instructional and research activities are allocated directly to the unit responsible for the activity. ABB ’empowers’ greater local planning and accountability and creates incentives for units to more efficiently manage resources and expenditures. Further, direct control of resources generated from activities creates incentives to set priorities and develop new activities consistent with the overall mission and strategic goals of the institution. How are core resources protected, such as libraries, when they do not have tuition funding or ICR? Library expenses are included in the central operating expenses that are funded by the tax on ICR and tuition revenue. The Provost consults with deans, students, and faculty regarding priorities for central funding, including the libraries. This consultation occurs with groups including the Board of Deans and Chancellors (BODC), the Provost Advisory Committee for Students (PACS), the Faculty Senate, the Senate Committee on Planning and Budgeting (SCPB), and Elected Faculty Councils. How can ABB be leveraged to ensure it encourages collaboration between dean-level units? Deans, chairs and faculty must be diligent in finding ways to participate in and encourage collaboration. Revenue sharing works for everyone if the advantages of collaboration for recruitment and retention of faculty and students are understood and valued. In 2014, the BODC endorsed a Statement of Collaboration, and the concepts noted in the statement need to be supported through actions. The document also provides best practices to foster discussions between faculty, chairs and deans, and between dean-level units. How can I model the ABB revenue effect of generating more student credit hours (SCH) or of starting a new program? It is possible to use the data in the Excel file that provides tuition distribution calculations to model the effect of changes in enrollments, SCH, majors, or tuition rates. Unfortunately, that file is not designed with an interface that easily allows the user to do so. More importantly, all of the data needed to do ABB calculations are now available in the Enterprise Data Warehouse (EDW). In addition, a variety of dashboards and modeling tools will be made available by the end of FY17. When ABB was introduced, some colleges received supplements. How are supplements determined? When ABB was implemented there was no change to a unit’s total General Operating Funds (GOF) plus Designated Operating Funds (DOF) budget. The total GOF/DOF budget remained the same but it was broken into three new conceptual budget categories. Based on ABB methodologies, the tuition value was calculated, the ICR was determined to be 35 percent of the total grant activity for the prior year and the remaining amount was placed in the category known as the supplement. This meant that each unit’s budget was the same before ABB was implemented as it was immediately after implementation. From this point forward, additional allocations of funds are made each year that can and do change the value of the three ABB budget categories: new tuition dollars, changes in research activity and/or ICR, and a variety of changes to the supplement (for example, state funds for benefit changes, state funds for compensation, or Provost Reinvestment funds for backfilling tuition cuts or any other initiative). There are a variety of reasons the value of a unit’s budget may change. Allocations of incremental tuition revenue and ICR are guided by the principles of ABB, and the Provost decides on the level of the supplement, in consultation with the BODC, SCPB, and PACS. How can ABB be implemented such that it does not disadvantage innovation? The University’s resources have always been limited, and innovative ideas have always outstripped the resources available to support them. In this way, ABB should not change the way innovation is supported. If a particular innovation requires funding, then it must effectively compete with all other funded efforts. Investing in innovation is a strategic decision. An example would be that a new, innovative course might have fewer students initially than another, but the newer course is expected to provide much better preparation for later courses, and enrollment might be predicted to grow. Keeping the old course rather than starting the new course might be financially beneficial in the short run but it is not an ideal strategic decision. Ultimately, ABB is a budget model intended to support the strategic plans in dean-level units, not to be the driving force behind the strategic plans. Optimistically, by better understanding and predicting the flow of funds, chairs, deans and the Provost can more confidently invest in innovation. What are the advantages of ABB? ABB provides transparency and predictability around the budgeting process. Subsidies are deliberate rather than accidental, and they can be strategically managed. One size fits all models tend to fail. If ABB does not work for my unit, department or college, how can we seek accommodations? Special cases are handled through discussions between the Provost and deans. ABB revenue is dispersed at the dean level. The dean is empowered to respond to units that are challenged and to bring concerns to the Provost when a necessary response is not attainable. Ultimately, ABB provides the transparency and predictability needed to manage a large complex organization, but our core values require us to prioritize sustainability for the key components of our mission. ABB decentralizes authority to the deans. What are the mechanisms available to affect the deans’ use of ABB dollars? Deans are accountable to the Provost, and all budget issues receive input from the faculty (SCPB, the Faculty Senate, or Elected Faculty Councils) and students (PACS). I am teaching a new undergraduate course that serves 400 students each year, but I have no new resources at my disposal. Isn’t that an indication that ABB isn’t working correctly? Under ABB, incremental tuition revenue is distributed to schools and colleges rather than to departments or individual faculty. If you are responsible for increasing the share of undergraduate student credit hours (SCH), then your school or college will receive additional tuition revenue, and budgeting within the school or college will occur in whatever manner the dean chooses. I have heard that we only receive 40 cents of each dollar of tuition because a lot of financial aid is subtracted and then the 30 percent tax is applied. 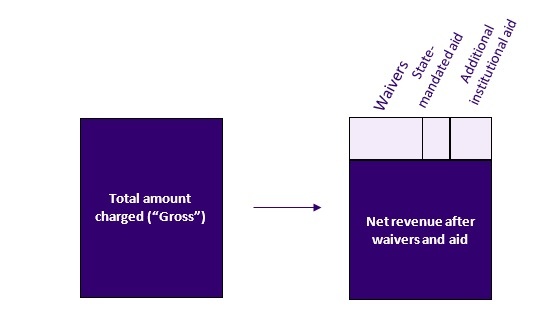 How does the amount of “gross revenue” get whittled down to the much smaller amount of net revenue (that is then taxed before it is distributed)? Gross operating fee revenue is the sum of the operating fee that is charged to all students, before any exemptions or waivers are taken into account. We waive tuition for many students and we award financial aid to students in order to ensure access and attract the best students. There is no expectation that every student will pay the full tuition “sticker price.” In recent years, net operating fee revenue has typically represented 80 percent of the total amount charged (“gross revenue”). Slightly more than half of the difference between “gross” and “net” operating fee revenue is accounted for by tuition waivers – most of which are provided to graduate teaching and research assistants. Please note that tuition waivers represent forgone revenue, rather than an expenditure. The rest of the difference between “gross” and “net” revenue is associated with the portion of tuition revenue that is set aside for financial aid. The UW is required by the state to use 4 percent of total collections for need-based aid. In addition, UW Regents have chosen to devote an additional portion of tuition revenue to aid to ensure access. The bulk of this additional aid is awarded to undergraduates and, therefore, is subtracted from undergraduate revenue. As a result, the main source of the gap between gross and net tuition revenue for units that serve mostly graduate students is the amount of revenue foregone by waiving tuition for graduate assistants. The bulk of the gap for units serving mostly undergraduate students is aid that is employed to ensure access for undergraduates. Given the different sources of the gap between gross and net tuition for different groups of students, the net to gross ratio varies dramatically by group. As examples, the net to gross ratio for the Nonresident Graduate Tier I category is 26 percent, whereas the ratio for undergraduate nonresidents is 91 percent. What are indirect cost rates and what is indirect cost recovery? Indirect costs, also known as Facilities & Administrative costs or F&A costs, are those costs incurred for common or joint objectives that cannot be identified readily and specifically with a particular sponsored project. F&A costs are defined by the Federal Office of Management and Budget in the Federal Uniform Guidance. More information is available at this F&A brief. The indirect cost rate is the rate applied to eligible expenses on a grant or contract budget to track the amount the sponsor will reimburse the University to help cover F&A costs. This rate varies depending on the sponsor and the type of research carried out (see current indirect cost rate chart). Indirect cost recovery is the dollar amount the university receives as reimbursement from a sponsor to help cover F&A costs. It should be noted that this reimbursement does not cover all the F&A costs that support research activity at the University, in part because the administrative portion of the costs is capped at 26 percent. How are indirect cost recovery dollars allocated to campus? The University receives the indirect cost reimbursement from sponsors and allocates the funds based on ABB principles and guidelines. Dean-level units that generate ICR retain 35 percent to support their portion of administrative costs. The other 65 percent is used by the Provost to fund campus facilities costs, research administration costs and to allocate to units based on initiatives and other criteria. The ICR allocated is based on the grant activity of the prior year. How does ABB impact the return of indirect cost recovery? 35 percent of the indirect cost recovery is returned to the dean level. Depending on local policies and guidelines within the unit, a portion of the indirect cost recovery may be reallocated to departments and/or principal investigators through local campus budgeting procedures, but each unit has its own policy. The PI should not assume they will receive a portion of these funds. In all cases, the intent is to support the research effort within the dean- or vice-president-level unit. Has the implementation of ABB impacted ICR return to colleges and departments? ABB will provide a somewhat different ICR return to units, but it is difficult to determine the precise difference given the complicated pre-ABB methodology for calculating indirect cost return. Spot-checks have shown that in general, dean-level units have more ICR return post-ABB than pre-ABB. The indirect cost return rate increased for on-campus grants, which are the majority of funding for all units, so we would predict a net increase in indirect cost return after ABB implementation. The number and the types of grants and the mix of on- and off-campus grants within any given unit vary from year to year, which also affects ICR. These factors make it difficult to determine whether, and in what direction, ABB specifically impacted a unit, or if fluctuations in the indirect cost rates and location mixes are the reason for shifts in ICR allocations. It is most likely a combination of factors, not one specific factor. Does indirect cost return change based on whether research is done on campus or off campus? The indirect cost rate of a grant has an impact on the amount of indirect cost recovery dollars. The 35 percent return rate is applied to the indirect cost recovery amount, which in turn impacts the allocation to the school/college. Lower indirect cost rates yield fewer indirect cost recovery dollars and higher indirect cost rates return more indirect cost recovery dollars. So, if a school/college/department/PI has a majority of grants and contracts with low indirect cost rates, then the return of indirect cost recovery is lower to that school/college/department/PI. Off-campus grants have facilities charges (rent or lease costs) as a direct cost, decreasing the indirect cost rate that is charged. Therefore, the indirect cost recovery per direct cost dollar is less for an off-campus grant than for an on-campus grant. However, off-campus research activities may have increased costs to the administering unit, so the net costs to the unit should be considered when assessing the indirect cost return for on-campus vs. off-campus grants. How have ABB-related changes in ICR impacted collaboration? The Faculty Council on Research survey of faculty indicated that there has not been a significant change due to ABB related changes. How are ICR returns properly allocated in the setting of inter-unit research collaboration? The University of Washington has guidelines about sharing of indirect cost return. Because it is difficult to develop a one-size-fits-all policy, flexibility is allowed, but the concept of revenue sharing is the same for all. In general, ICR should be allocated according to where the work is carried out. It should be noted that the reimbursement rate for F&A costs is lower than actual costs, so no unit is fully reimbursed for the indirect costs of supporting research at UW. How can units plan if ICR returns change every year? A portion of ICR has been returned to units for many years before ABB implementation (as RCR), so the fluctuations in this revenue stream are not new. ICR returns depend on the total grant activity and the ICR rate for each grant. Units can track ICR expenditures through the year, and project revenue returns in that way. After a grant is awarded, does the indirect cost rate change if the grant moves to a new location? Once a grant is awarded the actual indirect cost rate does not change. If the grant moves to a new location the old rate moves with it. A rate doesn’t change until the grant is renewed or when a new grant is established. How is a unit’s ICR value tracked following the implementation of ABB? Prior to ABB, ICR budgets could be summarized by selecting DOF budgets using the correlating budget type/class category. This is no longer possible after the implementation of ABB. The value of each unit’s ICR is continuously tracked via ABB tables and allocations, which are published on the web. These activities are taxed at a rate outlined by ABB. The tax is part of the funds the administration uses to address the President’s and Provost’s priorities for the University and deployment of these funds is the result of a lengthy and highly consultative budget development cycle.